In theory, lead generation seems so simple, doesn’t it? You create a lead magnet, add a lead capture form to your site, then promote the hell out of it and BAM! Your list begins to grow. It’s just that, when you actually try it, you quickly realize that getting any meaningful results isn’t that easy, right? But I can assure you, often, the lack of signups is down to simple mistakes you’ve made along the way. 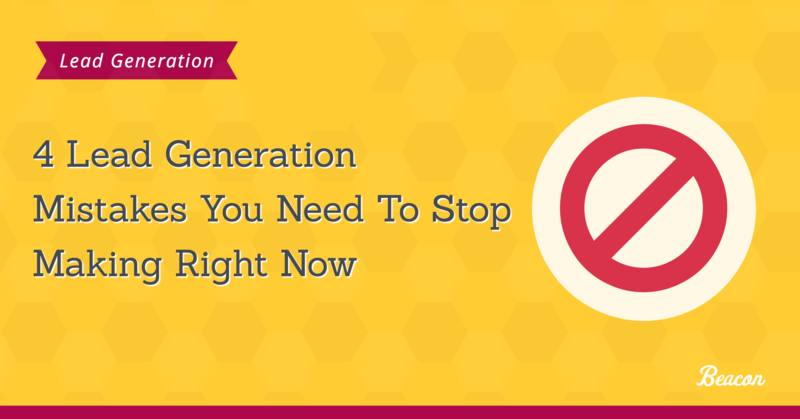 And so, in this post, I decided to show you 5 lead generation mistakes that even some seasoned pros make every day. I’ll also point you strategies that would help you fix them and boost your email signups. Not every blog visitor is at the same stage of the buying cycle. Sure, they might be experiencing a similar pain point – the problem your product helps to eradicate. But they’ll be thinking about it in different ways. And they’ll only sign up for lead magnets that promise information that’s relevant to their current stage of the buying cycle. Oblivious – these people feel the pain but aren’t sure what’s causing it. Informed – these leads feel the pain so much that they need a solution right now. And as you can imagine, people in each group will seek different information. Oblivious leads will most likely look for more generic information about their problem. For example, a person experiencing computer problems will look for a guide explaining why their machine works so slow. However, at the Afflicted stage, they might seek out more practical information about improving their computer’s performance. Once they reach the Informed stage, though, they’ll seek more detailed information about products or other solutions they could implement to get their computer working properly again finally. Make sure that you publish content that targets visitors in all 3 categories and create lead magnets and content upgrades that provide each category with the exact information they’re looking for. TIP: The majority of blog visitors will fall into the first two categories – oblivious and afflicted. So make sure that the bulk of your content ideas focuses on those two groups. It’s a common mistake – you’ve created a single eBook or any other lead magnet type, and aim to build the entire list on that. But as I’ve touched upon in the previous point, not every visitor will be interested in its topic. In fact, I can assure you that only a small percentage of your blog visitors will engage with your lead magnet. And so, by publishing a single lead magnet, you’ll limit the list’s growth to a segment of your traffic. Launching multiple lead magnets, ideally for every major blog post you publish, gives you the opportunity to target various audience segments, and provide detailed, highly-relevant information that stands a chance to convert at a higher rate. Continuously create and launch lead magnets for your content. Instead of using a single eBook to convert blog visitors, offer content upgrades for every major content piece you create. Struggling to find the time to create lead magnets? See how Beacon allows you to create them in minutes? Let’s be honest about it – producing quality lead magnets on a regular basis is no small feat. You need to pick relevant topics (and as I showed you earlier in this post, there’s quite a lot of things to consider with that). Then, create the content (and even if you’re repurposing old blog posts into an eBook, you still need to write an engaging introduction). And finally, design the whole thing so that it looks nice. To top that up, you also need to produce an engaging call to action to ensure visitors find out about your lead magnet. Nope, not a small feat indeed. And so, it comes as no surprise that so many businesses find producing content upgrades and other lead magnets challenging. But you can speed up and even automate parts of the process. #1. Repurpose old content. You don’t need to create any original content for the lead magnet. In fact, most of the content you already have could work well as an eBook or checklist. Not sure how to repurpose content? Listen to my interview with Beacon’s CEO, Kevin McGrath below. In the talk, Kevin and I discuss repurposing content for lead generation and go through various strategies, tips, and tricks to create powerful eBooks, checklists or resource lists fast. #3. Use simple tools that help you automate the process. Beacon, for example, allows you to instantly convert your existing blog posts into professionally designed, downloadable content. (You can check out how it works here). Produce more and more content, hoping that some of it will stick and attract new leads. Use the data to pick anything, from the best lead magnet topics to pages you should promote them on the site. And guess, which of the two strategies most businesses opt for? Sadly, so many marketers choose to blindly produce content, without taking the breadth of data at their fingertips into consideration. #1. Identify what pages and topics attract the most visitors to your site. With this insight, you could quickly select the most relevant topics and content ideas for your audience. #2. Spot the most successful content on your site. Again, it will help you come up with strategies guaranteed to attract the most relevant traffic. But also, spot lead generation opportunities – content pieces that you could expand with a content upgrade or other lead magnet to convert their visitors into leads. #3. Assess the engagement, to identify further lead generation opportunities. (Not sure how to find and use this data? We posted a detailed walkthrough through the process HERE).